Should the Giants Sit Their Stars? The Giants are finally nearing the end of yet another lost season. Only one more game remains: a matchup against the Eagles at 1:00 this Sunday. While they get all the attention, teams that are locked into their playoff seeds aren’t the only teams who have to think about benching their stars. This week, the Giants face an intriguing decision: should they sit their studs to keep them safe or should they play them for pride? The main reason the Giants should consider sitting players like Eli Manning and Odell Beckham Jr. is that it makes no sense to risk your star players over a meaningless regular season game. Football is an inherently dangerous sport, and the more one plays it, the more likely it is that one gets hurt. Those who think that teams should play their stars, even in meaningless games, like to point out that Week 17 is no more dangerous to players than any other game, as shown in the graph below. 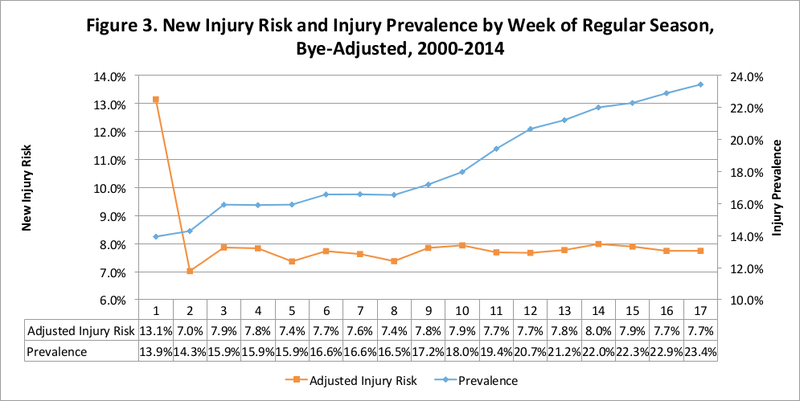 In this graph, (found here, at Football Outsiders) the orange line shows that the risk of sustaining a new injury is stable throughout the season (Week 1 looks like a significant outlier, but, as the article notes, “anybody who suffers an injury in the offseason, training camp, or preseason will first appear” in Week 1’s stats). Accordingly, the logic goes, teams should play their stars because the risk of sustaining a new injury in Week 17 is no greater than the risk in any other game. There’s an easy retort to this argument. While it’s true that a player is not more likely to get injured in Week 17 than in any other week, it’s also true that a player is more likely to get injured playing in a Week 17 game than sitting it out. Why should the Giants increase the risk of an injury to Manning or Beckham Jr. even slightly by playing them in a meaningless game? It’s important to note that this graph does not indicate what kind of injuries were sustained. Obviously, there’s a significant difference in importance between a mild hamstring strain and a torn ACL, and that difference needs to be taken into account when determining the risks of playing one’s stars in a meaningless game. Logically, there’s no reason why the rate of serious injuries in Week 17 should be different than in any other game, but if anyone has any statistics on the matter, please email me at sushionsports@gmail.com. Many will say that Eli Manning’s streak of 150 consecutive games started should not be broken, and that he needs to play to keep the streak alive. However, there’s a simple solution to this problem: play Manning for the first series of the game, and then sit him down for the rest of the afternoon. The biggest reason the Giants should play their stars is out of loyalty to their fans. This game is being played in the Meadowlands, the Giants’ home stadium. The cheapest seat in the stadium, according to StubHub, is $50. That’s a significant amount of money to shell out for a team that’s not trying to win. The Sixers, the preeminent tanking team, have realized that no one wants to pay a lot of money for a team that intends to lose. Accordingly, for their next home game, against the Timberwolves, the cheapest ticket available on StubHub is for a grand total of $9. That’s all. The price for a seat right behind the basket is $44. That’s cheaper than the cheapest seat in MetLife Stadium! The Giants owe it to their fans, who are paying a lot of money to come watch the team play, to do their best to win the game. If it was on the road, that’d be another story, but it’s not. People come to Giants games to see Beckham Jr. and Manning, not Sidney York and Ryan Nassib. And, just to prove my point, you definitely didn’t realize that Sidney York is the name of an electro-pop band, not a football player. Rather, it’s Elliott Brood who’s the current WR6 on the Giants. So what do I think the Giants should do? It’s a tough decision, and I’m glad I don’t have to make it. Still, if I had to choose, I’d lean towards playing the stars for the sake of the fans. If I’m the Giants, I definitely don’t want to be compared to the Sixers. And besides, who wants to see guys like Elliott Brood play football? Well, actually, it might be pretty awesome as, although you didn’t notice, Elliott Brood isn’t a wide receiver; it’s a Canadian alt-country band. And unless you want to see these guys playing for the Giants, you’d better hope the starters are playing on Sunday. This article can also be found at Jock Journal. This entry was posted in Football, NFL and tagged 76ers, Big Blue, Chip Kelly, Chip Kelly fired, Coughlin, Eagles, Eli Manning, Football, Football Outsiders, Giants, Kelly, Manning, New York, New York Giants, NFL, NYG, OBJ, Odell Beckham Jr., Philadelphia, Philadelphia Eagles, Sixers, Tom Coughlin, Week 17 on January 1, 2016 by Sushi Kaplan.